Eel Weir State Park is located on the Oswegatchie River two miles from Black Lake just south of Ogdenburg. Both waterways are known for excellent bass fishing and are ideal for canoes or rowboats. As it is small and secluded, the park is a perfect place to get away from it all. 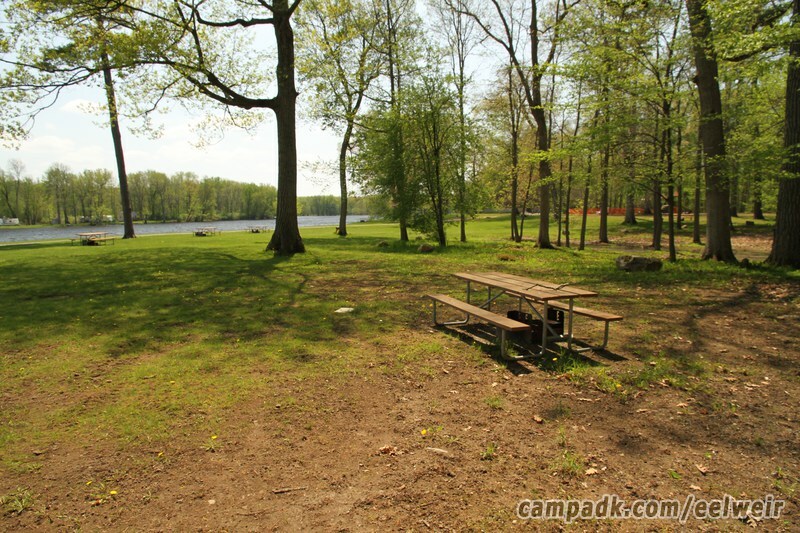 Thirty-eight campsites are available, as are a picnic area and pavilion. Most sites are right across the road along the river or have a river view. Eel Weir is a WALK-IN only facility, ie no reservations required. Remember that Eel Weir is walkup-only! There are no reservations here. Boat Launch Small boat launch right inside the campground by site 21 which can handle launching small powerboats, canoes and kayaks. 3 out of 5 lakeside stars. Offers a fine lakeside camping experience with sites close, or directly by the water. 2 campsites are directly by the water and another 13 are just across the road from the water. Located on a river for enjoying water activities including paddling, boating and fishing. Tree Cover Lightly wooded with mainly deciduous trees. Partially shady sites. Water Somewhat narrow river with current. 2 miles upstream is Black Lake which is a narrow long body of water. Beach There is no beach or swimming at Eel Weir. Paddling Paddling on the Oswegatchie River, along with Black Lake with is two miles upstream. Boating Boating on a somewhat narrow river (Oswegatchie River). Note! The Weather frame below is for the Weather Underground site. This frame is provided for your convenience only. You might wish to open a separate window/tab instead to view Eel Weir weather in more detail. Note! The Weather frame above is for the Weather Underground site. This frame is provided for your convenience only. You might wish to open a separate window/tab instead to view Eel Weir weather in more detail. Note these comments are NOT particular to a specific campsite at Eel Weir ! Sorry no campground map available at this time. You can view the map on the Reservations System however.